Innovative patented technology for increasing the power output of large wind turbines. Wind energy is considered to be one of the fastest growing markets globally. Leviathan Energy, using aerodynamic modeling, has developed a unique, passive structure that can be adapted to any wind turbine from any manufacturer. 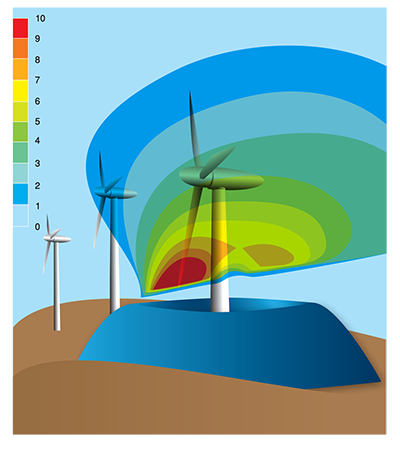 Leviathan’s technology significantly increases the power output of existing wind turbines by directing the surrounding wind flow to the critical area of the blades by designing a unique structure near each turbine. The most moderate estimated period of return on investment (ROI) for the Wind Energizer is 4-5 years. On the right is a computer model of custom-designed structure (patent pending), which, when in exactly the right position, increases wind velocity to the blades. In the picture, wind is coming from the left and the red area represents area of highest velocity.